It’s now September, so almost everyone has moved on from cherries, watermelons, strawberries, and peaches to apples, pumpkins, cranberries, and pumpkin spice. I do love all of those fall flavours…but I’m not ready. My warm-weather-loving-self is hanging onto summer with everything I have. Which is why my thinking (and taste buds) have not shifted over yet. It’s going to take me a little longer than most. It’s the same thing every year. Right now, my mind is still on one of my top 3 favourite fruits. Peaches. It puts a smile on my face each summer when the Ontario peaches show up in the grocery stores. I do like using them in recipes but I think my favourite way to eat them is just as they are. Slice one up into 4 pieces, remove the pit and enjoy. My mouth is watering as I think of how perfect they are. Do you love peaches as much as I do too? Or am I sounding crazy here? 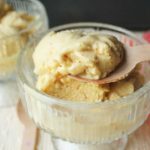 I originally intended for this coconut peach ice cream recipe to go up during peach season but it took me a little while to get it to a place where I was happy with it. Luckily, I found this article and used the advice in the section about ice crystallization (which was my main issue). It truly is a science to put together the perfect ice cream! But it’s so worth the wait. 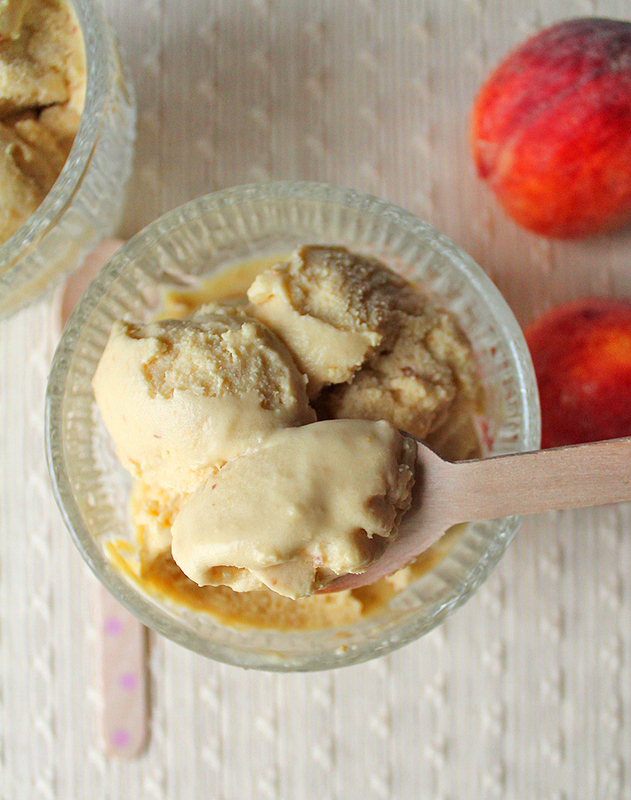 This vegan coconut peach ice cream is sweet but tangy with tons of coconut flavour. 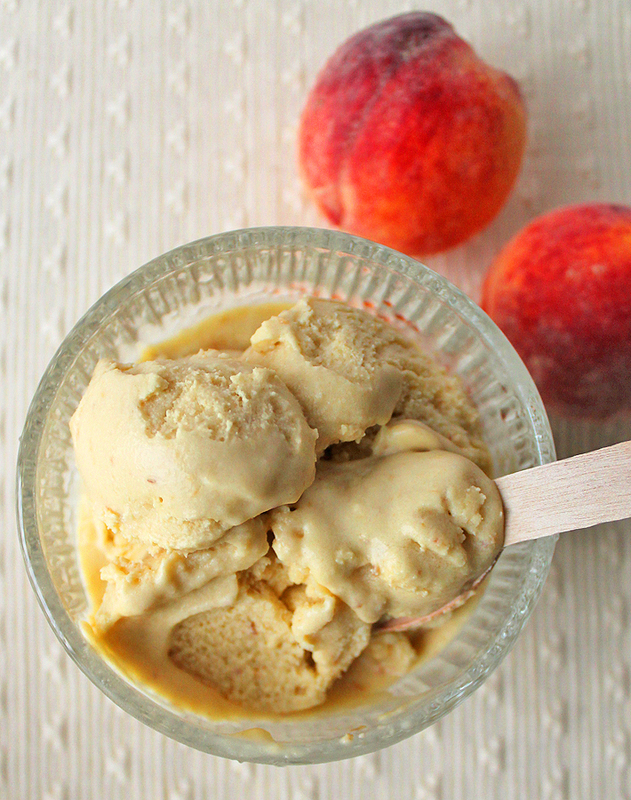 And because it contains peaches, it just screams summer. To make it extra fancy, you can toast some shredded coconut and sprinkle on top before serving. Something I thought of after I took these pictures. Of course. Before making your homemade ice cream, read this article. It will give you all the tips you need to make a delicious batch the first time. Freeze your ice cream maker’s bowl for a few days (even though the instructions may say to freeze for only 24 hours). When adding the sweetener, it’s OK if it tastes a little too sweet. Once it is churned and frozen, it loses some of the sweetness. Store your ice cream in an airtight container. Any air will contribute to crystallization and make the texture not-so-nice. Before serving, let it sit for a while before scooping, so it softens up. 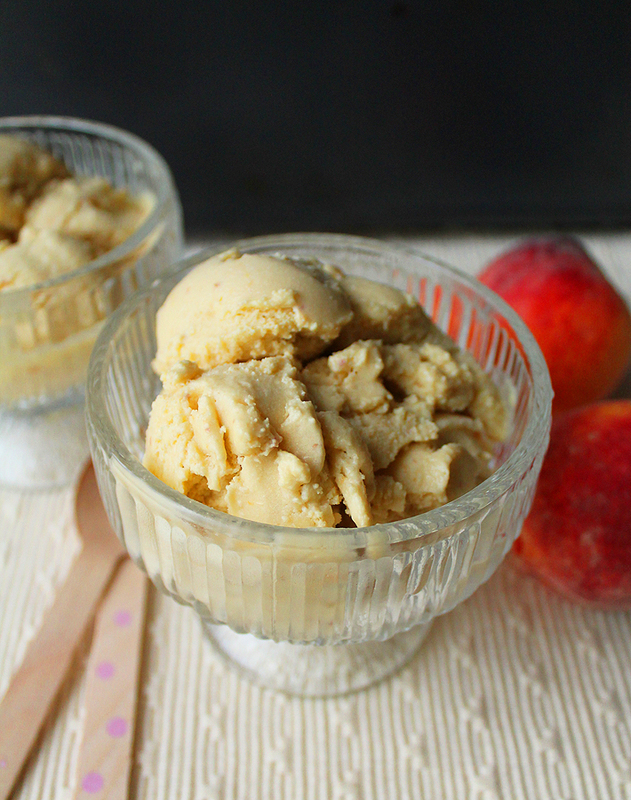 This vegan coconut peach ice cream just screams summer! It's tangy, sweet and contains a surprisingly delicious flavour combo: peach + coconut. Chill 1 can of coconut milk for a few days in the fridge. When it is chilled, turn upside down, open, discard liquid (or save for smoothies!) and scoop out coconut cream. Add to a blender. 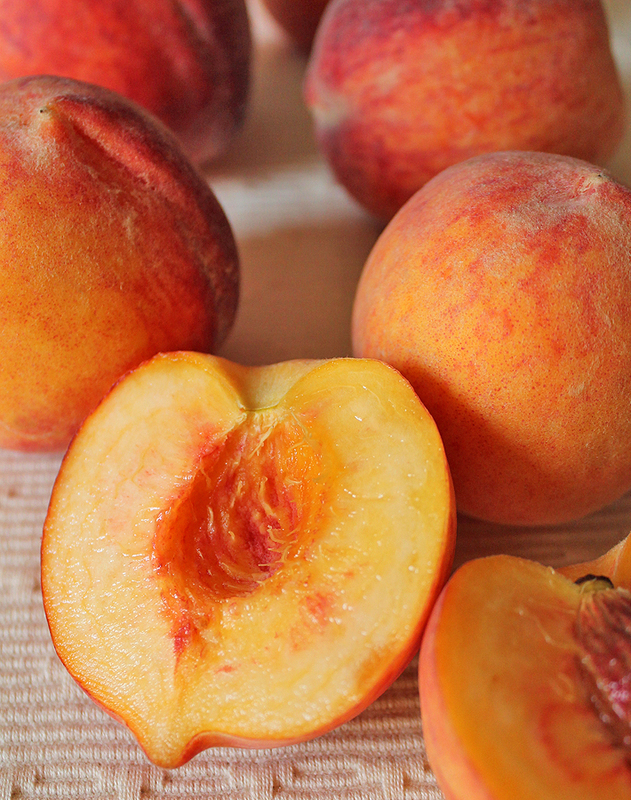 Slice peaches and remove pits. Add to blender along with coconut cream. Pour mixture into a medium sized bowl. Add can of coconut milk, vanilla, salt and maple syrup. Stir well to combine. Cover and refrigerate bowl until mixture is fully chilled, overnight if possible. Store in the freezer in an airtight container when ready. Churning time will vary, depending on your ice cream maker. When adding the sweetener, it's OK if it tastes a little too sweet. Once it is churned and frozen, it loses some of the sweetness. Eat all of it within a few days. This type of ice cream does not do well when kept in the freezer for a long time. I have so many peaches (I always over-buy them! ), so I am really excited to make this ice cream!! You are so lucky, Kristi! Peach season is almost over here. I hope you enjoy the ice cream! !